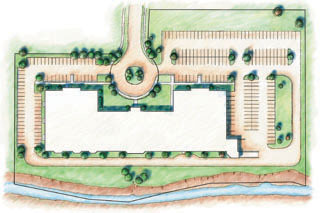 During the 1980’s and into the early 1990’s, Randal Birkey created hundreds of maps, site plans, master plans and architectural renderings of real estate development projects by The Alter Group. The Alter Group has been a real estate developer in the Chicago area for over 50 years, responsible for many of the most prestigious business developments in the area. 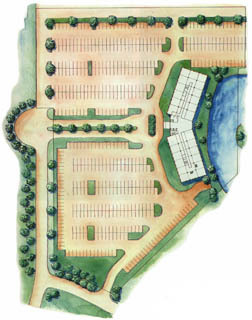 The illustration style we adopted was a loose, sepia pen & ink line style with watercolor added for texture and color. This look became part of The Alter Group brand look and design during those years.